What to pack. What to wear. How to tip, Best Restaurants and much, much more. everything they need to know about taking a river cruise! One of the most important points of distinction between Premier and other travel agencies is that we’re experts about all aspects of river cruising. Everyone on staff has at least 20 years of experience. While being an expert should be important to you, we believe it’s how we use that knowledge that’s really, really the key. At Premier, you’ll always receive the best price and service, we guarantee that! 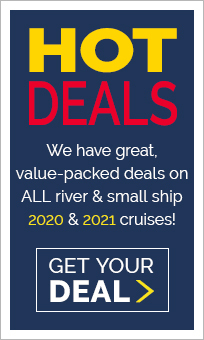 But, does a great price mean you'll be well prepared to maximize the enjoyment of a river cruise vacation? 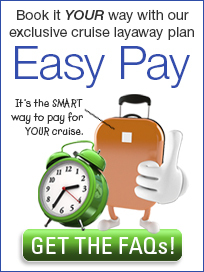 If you are not buying your cruise from Premier, probably not! It's our expertise that makes the difference for you and here's a few of the reasons why. the enjoyment you’ll receive from your river cruise vacation. How? When you work with one of our expert agents, they’ll find just the right cruise for you; one that reflects your personal list of needs, wants and desires, all at an affordable price. Then, they will prepare you better than any other travel agency, or any cruise line can to maximize the enjoyment of your river cruise, here's part of how we achieve that for our customers. lands can be a bit daunting and at times even overwhelming. With that in mind, we’ve used our many years of international travel experience to create our exclusive, destination-specific COMPASSPOINT™ Guide. Each Guide in the series is chock-full of valuable information and hints that will help you plan, prepare, and even pack for your river cruise... right down to what the temperature will be in each place you visit, at the time of your visit. 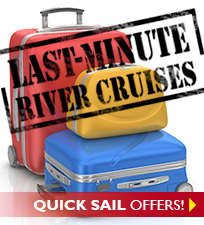 for river cruises in the U.S., Europe, Russia, Southeast Asia, China and Egypt. These Guides, written by our staff and updated yearly are all geared to the time of year you cruise and the destination you select. If you’re doing a pre and/or post land stay, you'll also receive our Premier Thoughts on your land stays. Thoughts are unique booklets of information and insights that our staff have gathered in personal visits to cities such as; Amsterdam, Budapest, Paris, Prague, Lyon, Lucerne and many, many others. With our Premier Thoughts, you'll learn about some of our staff's personal favorite sightseeing hints, information on local transportation, cool local restaurants, best shopping opportunities and even local tipping customs — all guaranteed to greatly improve the enjoyment of a river cruise, make it “hassle free,” and one of your best vacations ever. 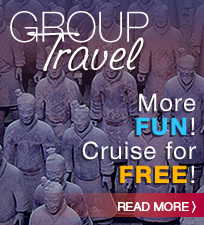 NO other travel agency or cruise line in the world provides this type of comprehensive material and it's free to our customers. of our Guide secrets right away! 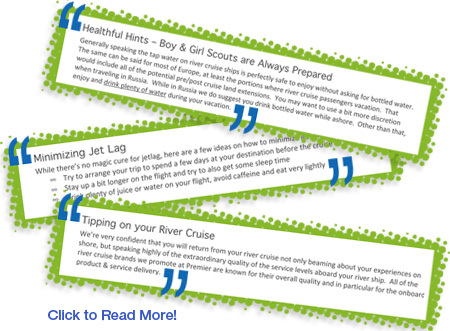 With every customer, Premier goes to great lengths to ensure a perfect river cruise vacation and our exclusive COMPASSPOINT™ Guides are just another example of the Premier Difference... what sets us apart from other travel agencies. It’s time you experience the best cruise values, services and personal attention that you deserve in planning, booking, preparing and enjoying a wonderful river cruise. 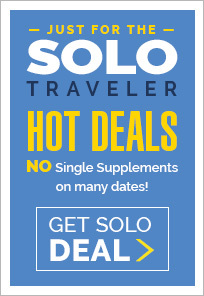 You can start to do that right now... call one of our expert Travel Planners and discover the Premier Difference! Click HERE to read what our customers are saying about the COMPASSPOINT™ Guide Series!